Do you remember the first time you fell in love with a movie character? I’m not talking about lust, but something much more innocent. I’m struggling to put this feeling into exact words – imagine a sense of wanting a deep friendship and of caring for this fictional character. Can you picture said character? I’m guessing everyone has one. Well, mine is (and forever will be) Seymour Krelborn from Little Shop of Horrors. This love of Seymour spiraled into an appreciation for all things Rick Moranis-related, but for today we will focus on Little Shop of Horrors. Seymour Krelborn isn’t meant for Skid Row: he is too pure, too kind, and too trusting of others (including giant carnivorous plants from outer space). Rick Moranis infuses his character with a sense of wonder and optimism that no longer exists in those around him, be it the “Greek Chorus” urchins, Mr. Mushnik, or Audrey. The others have let Skid Row beat them both literally and metaphorically. Audrey (Ellen Greene) has given up on ever leaving Skid Row for “Somewhere That’s Green” and believes that she doesn’t deserve a man like Seymour. Mr. Mushnik (Vincent Gardenia) is ready to close up his flower shop due to the lack of any customers. The Greek Chorus work as a stand-in for what every person living in Skid Row must face, being stuck forever in a dead end neighborhood with no hope of escape. But Seymour Krelborn is different. He thinks that he is trapped, is in love with Audrey and believes it is a hopeless cause, he handles Mr. Mushnik’s casual cruelty each day… and yet. Despite all of that, Seymour is still a kind person. How could anyone not fall in love with him? 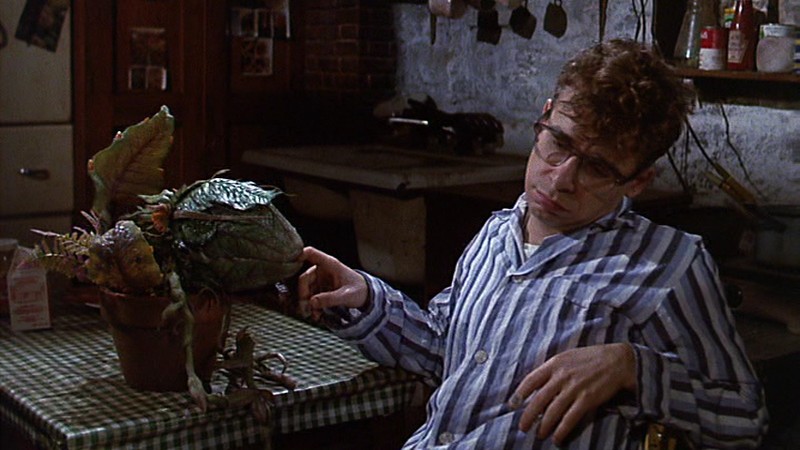 Beyond my love for Seymour, Little Shop of Horrors is a perfect movie for me. Directed by Frank Oz in 1986, this is a movie where every single piece pushes all of my right buttons. I watched the film three times over two days in preparation for this article and each time I found a new bit to swoon over. A line reading I hadn’t caught before, a bit of pure genius in the form of puppetry, or a lyric. 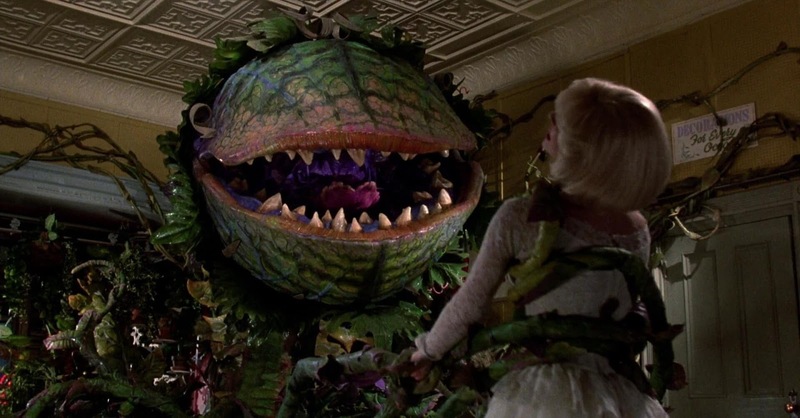 Little Shop of Horrors isn’t bright and cheerful in either looks or mood, but the songs and acting turn it into a great time. I dare anyone to listen to the soundtrack and not sing-a-long or find themselves bobbing their heads. Don’t tell me if you don’t – it just means that I won’t trust you ever again as nothing could sway me from adoring Little Shop of Horrors. • The way Orin Scrivello (Steve Martin) says “Catchy name. It’s big.” when seeing Audrey II for the first time. • The squeak Audrey gives when finding out the name of the plant. • Audrey II and Seymour dancing with one another during "Feed Me." • Audrey II checking the payphone for change after setting a trap. • Mr. Mushnik hating Orin – he’s not a nice guy, but even he knows how to spot a real jerk. • Crystal, Ronette, and Chiffon – no particular scene, I love them in general. If you haven’t seen Little Shop of Horrors, what are you waiting for? 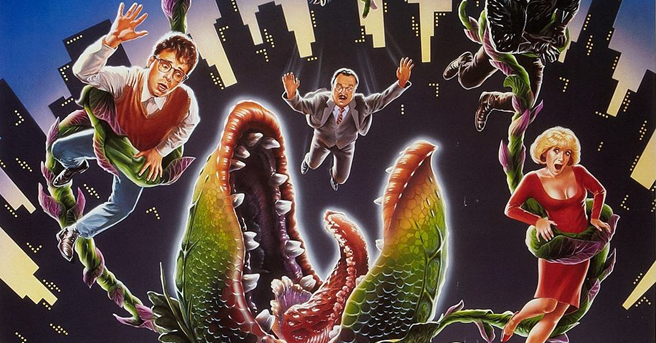 You won’t be disappointed as it will give you everything from Rick Moranis, giant puppet plants, murder, and music. If that’s not a good time, then I don’t know what is. Oh god, I haven't seen this in years and forgot how much I love it. Everything with Steve Martin was always my fav, and I always loved Bill Murray's masochistic dental patient. I have not seen this since my father had HBO in the late 1980s. I remember it being a fun film. How do feel about the original film, Robyn? For a two-day shoot, I think it is very good. Little shop always has a spot in my top 5 movies of all time. I recently held a screening and little shop never fails to bring down the house. Every scene is gold. like every scene. There is never one dull moment without music, joy, or humor. I love it.